Want to learn to Window Tint by a professional? This highly detailed and informative DVD covers important areas such as tools and supplies as well as comprehensive installation procedures for every window of a vehicle. Featured instructor, Timothy Schmidt, has been installing window film on all types of vehicles for nearly twenty-five (25) years. His in-depth knowledge of the craft has come together on this 84 minute "How To" video which has assisted hundreds of installers to learn window tinting skills in a shorter length of time. 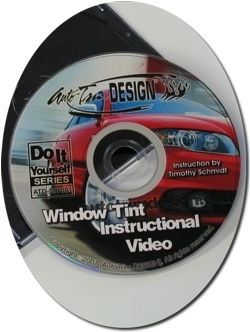 Rest assured that this remarkable instructional video production in our Do It Yourself Series library will bring one to the next level and appreciation of the fine art of window tinting. * Windshield visor procedure ~ & More! !